I love doing this series What’s On Your Camera Roll because it reminds me of what has happened in my life and what I have deemed important enough to snap a picture of. While so many of my pictures are silly ones I am often able to capture some great moments that remind me of a special time or evoke a memory. It’s been a long couple of weeks as many of you know with the death of Chris’s brother on March 21st but as life gets back to a somewhat normal (is there ever normal? ) schedule I am realizing even more that it is more important to seize the day and just live. So what if my windows are dirty? Who cares if I finally got the hardwood floors cleaned last night after at least 3 weeks? I am lowering my stress levels and just trying to enjoy life a little bit more each day. So without further ramblings here are a few of my favorite shots from the past couple of weeks that captured a few moments to remember. 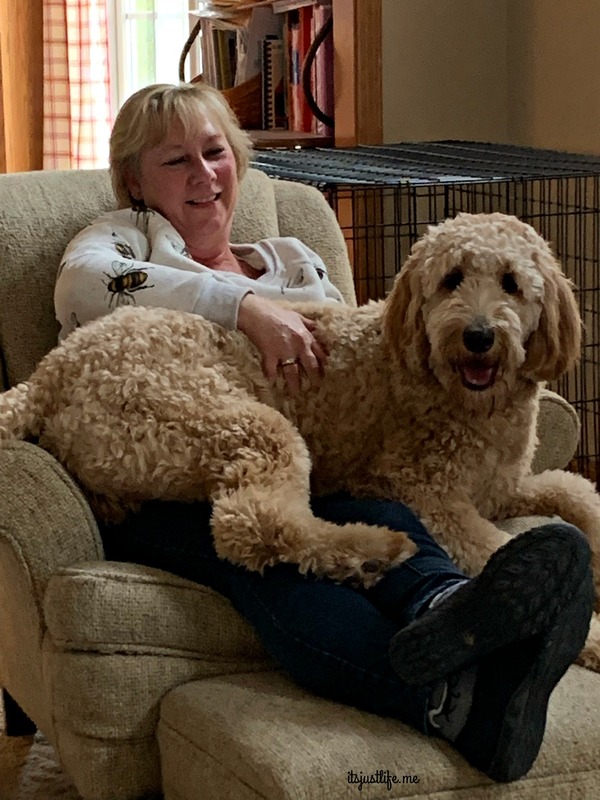 Meet Marshall – my niece’s dog who thinks he is a lap dog. A trip past Chris’s old house in Lima revealed that in the past year or so it has been “flipped” and is for sale and looks amazing both inside and outside. It makes me happy to think someone will have a great life in this house. 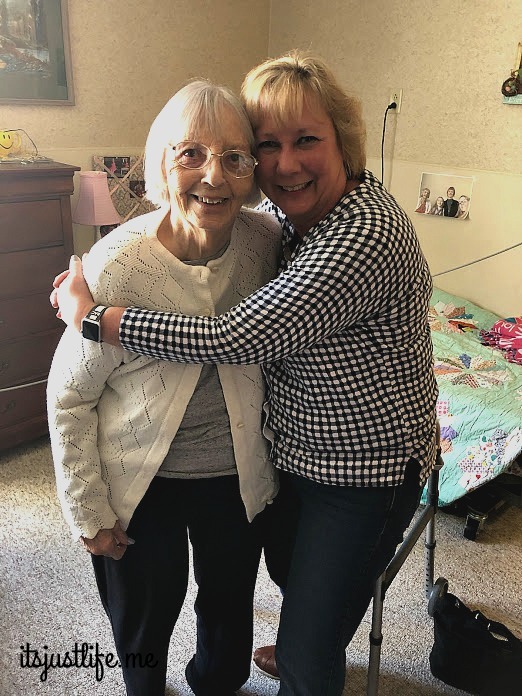 I was able to visit my mom twice when we were in Ohio and she was having good days both times so it was a wonderful time for both of us. So grateful. 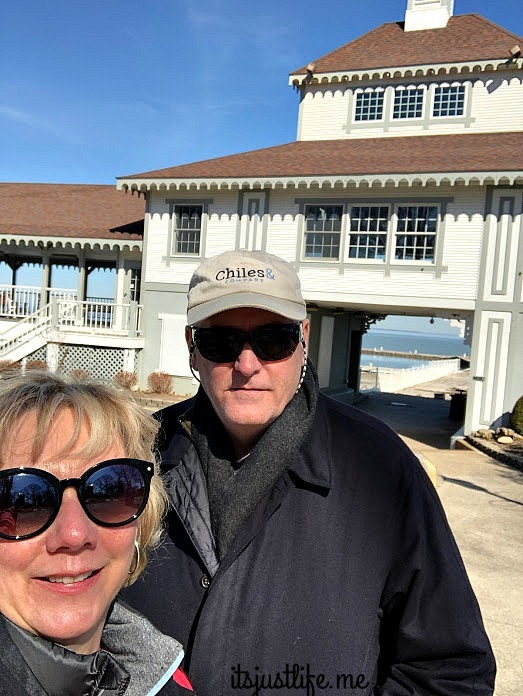 Chris and I took a couple of days to chill out at the lake and hit our favorite little town Lakeside on a brisk but sunny day. 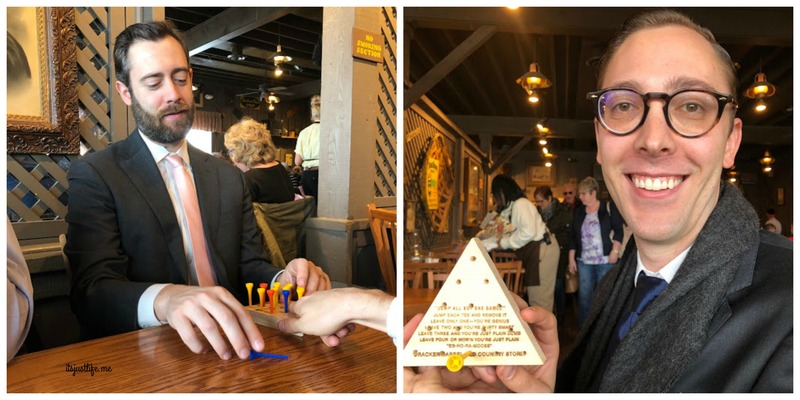 Micah and Aaron flew in for the service and we had a rare family meal at Cracker Barrel where the competition was apparent. Coming back home after 12 days Mils Holly was happy to see me. 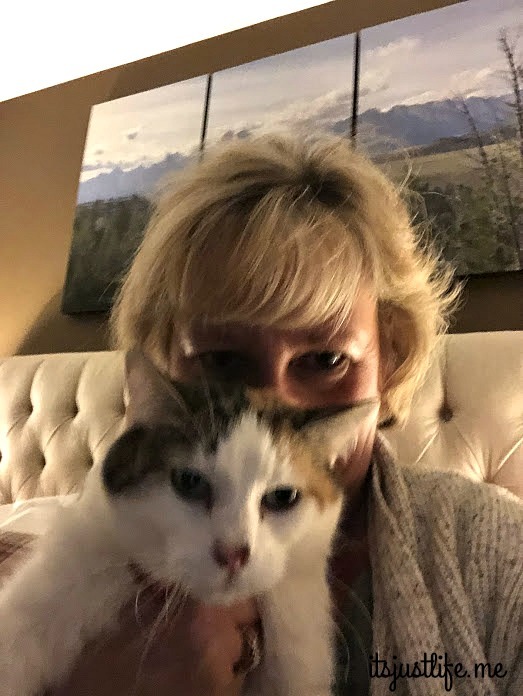 She has stepped up to being an only cat but we still miss Buddy terribly. 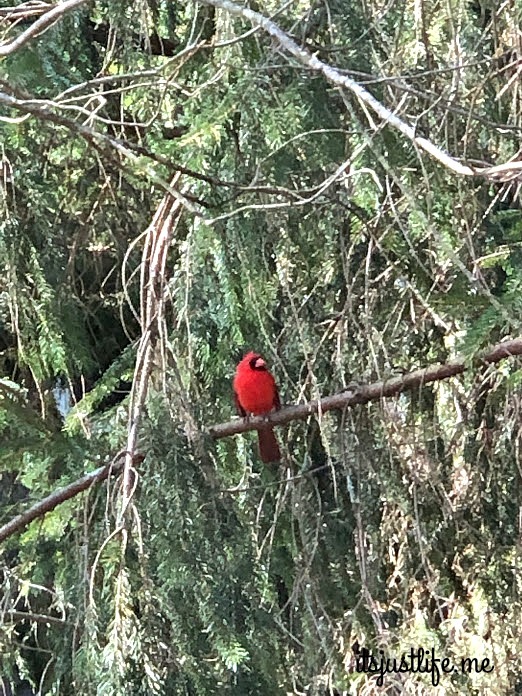 Cardinals have been everywhere in our yard and are a reminder to me of loved ones who have passed. 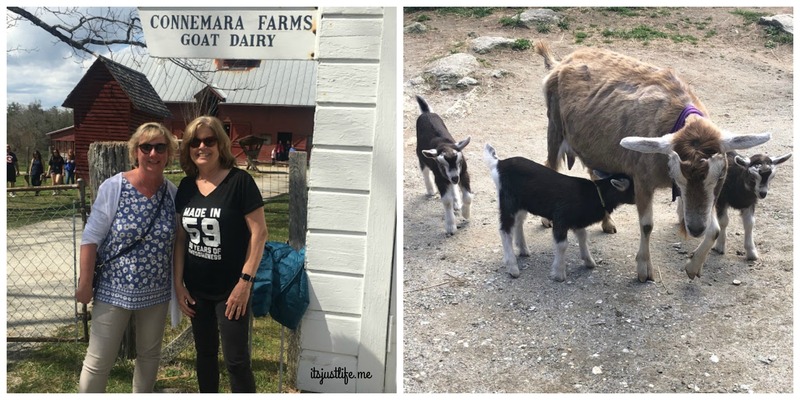 I got to spend a wonderful day celebrating my friend Beth’s birthday and yes–there were goats involved! Babs and her three kids were my favorite . 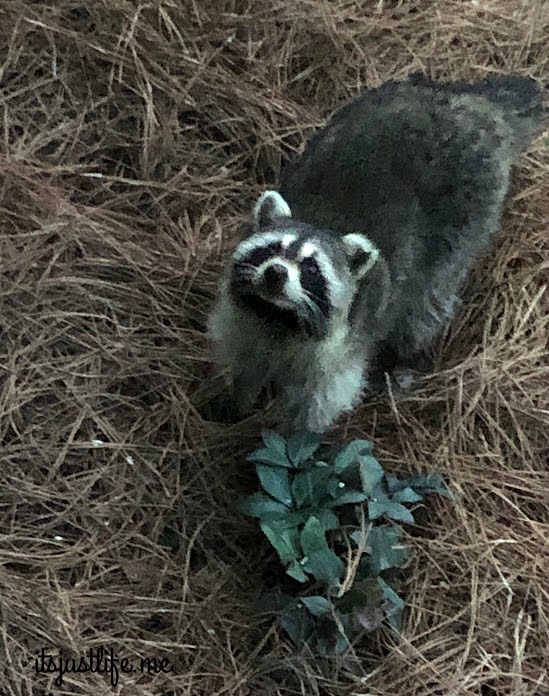 Our after dinner trash panda guest that I had to chase off the deck. He was none too happy with me but I wasn’t sharing my pork chop with him this time. So tell me – what’s on YOUR camera roll right now? Anything worth sharing? Tell me all about it in the comments and Comment for a Cause for Camp Robin Rogers. Read more about that by clicking here. Love the diversity of your camera roll! Me? Mostly birds, and of course my Katie-girl. Birds and Katie are the perfect pictures to feature on your camera roll. I can’t think of anything much better! Marshall is such a puppy still but he was just what we all needed to distract us. How fun to bake muffins with your young friend! I love it. Cute animals and family- the best photos! On my roll: snow, then a sunny day, a package of carrot cake Oreos, memes I wanted to save, a Cav’s game, hey, it’s just my life! I love what you have on your camera roll –it is JUST life and that is the perfect way to document it. How were the carrot cake Oreos? Chris wants me to find the Game of Thrones kind…..
You have a lot of interesting images on your camera roll. All themed to relationships except for the few nature images. My cellphone gallery is nearly 100 percent pix of the grandkids. I don’t take a lot of photos with my phone. Grandkids are the perfect subject for cell phones. I find that I take more cell phone pictures than point and shoot or dslr pictures anymore because I always have it with me and the quality is pretty good these days so I am usually happy with what I take. That puppy is huge–you are right. He is like a teenager—all gangly and leaping around like a ninny. But he was good medicine at a very sad time so it was good to be around him. I bet! Nothing like cuddles from animals or children in times of grief. Loved what was on your camera. Greatly variety. The one of you and your Mother is lovely. Thanks, Shirley. The one of my mom and me is definitely one that will remain on my camera roll and printed out as well. Fun camera roll you’ve got there! Mine definitely has a major theme going – my granddaughters, granddaughters, granddaughters…..in various circumstances. Makes me happy! If I had grand babies that would be dominating my camera roll as well. I love the picture of you and your mother. Thank you! IT is definitely one of my favorite pictures. We have a lot of pictures from our garden. For the last three years Michael has come to plant flowers in our former very plain yard. Each day I snap 2 pictures of new blooms so he can see the progress. We also spent a little time in Jerome and Sedona, 2 very pretty spots in AZ. Soon I will have pictures of most of my great nieces and nephews from age 2 to 15 on Easter. That will be fun! These are some of my favorite posts. I think we’re on track with you on the floor cleaning but now you have us beat:) That raccoon is very very cute. That raccoon is cute but a menace!! !